The U.K. bioscience ecosystem continues to flourish, reflecting the current upswing of the sector across the globe. Data taken from an annual report published by the BioIndustry Association (BIA) in collaboration with EY, shows that the U.K. continues to lead Europe in terms of capital raised and pipeline of products. It is an exciting time in the U.K., with many promising ‘green shoots’ emerging after the hard years following the dot-com crash and the financial crisis. Hard work by many stakeholders has given real momentum to the biotech sector, with a number of recent stock market launches to celebrate, promising patients hope. What is more, the City of London investment community has taken a real interest in biotechnology with several large funds established to invest in early stage science and help companies progress to realize true value – Neil Woodford’s patient capital fund being a prime example. The U.K. medical biotechnology sector comprises over 1,000 companies, generating an estimated turnover of $7.4 billion and employing around 23,000 people. Our science base is world class and the U.K. sector has produced blockbuster pharmaceutical products. The country is home to four of the world’s top six universitiesand six of the top 50 universities for clinical, pre-clinical, and health research. Coupled with the fact that the U.K. is leading the G8 for research productivity and U.K. scientists have been awarded over 70 Nobel Prizes, the strong science and research base present in the U.K. is clear. The country boasts the largest pipeline of new pharmaceutical product candidates in Europe, developing over 460 product candidates in 2013. 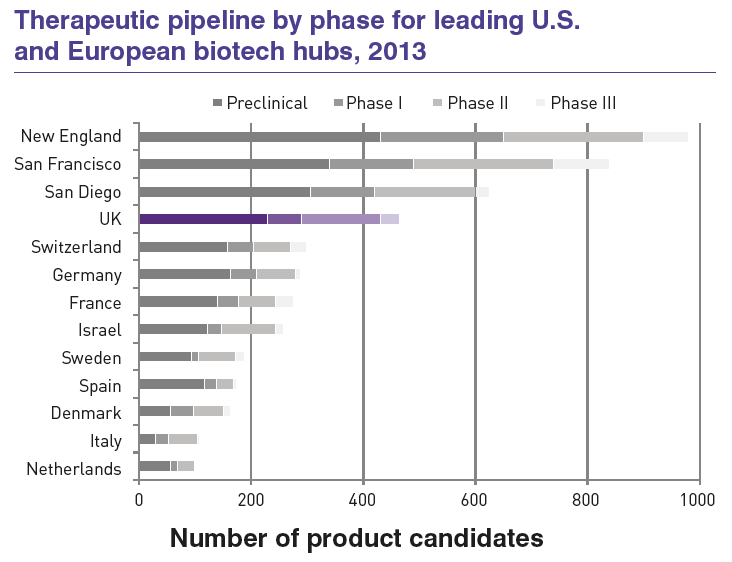 This strong pipeline has been preceded by a number of examples of healthcare success where U.K. biotech has played a vital role, including Humira, ranked by IMS Health in 2014 as the world’s best-selling drug. 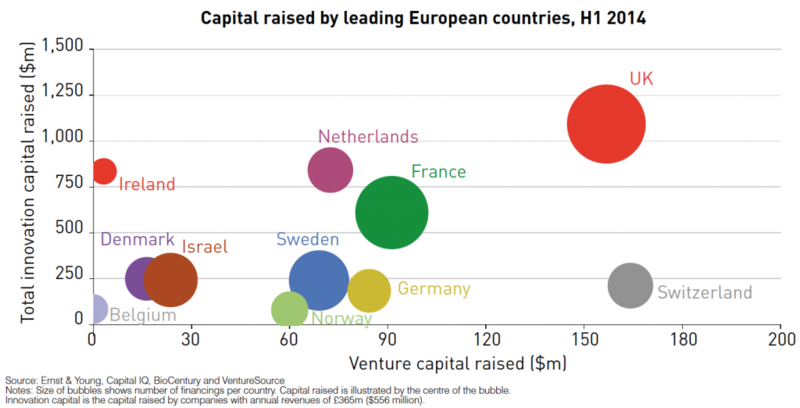 The U.K. remains a very favorable place to invest in high growth, innovative life science companies. Investors continue to recognize the quality of science in the U.K. biotech sector with U.K. life-science companies raising $1.13bn of innovation capital in the first half of 2014, surpassing the $744 million raised in the whole of 2013. The success of the U.K.’s biomedical ecosystem is underpinned by a number of supportive factors. A compelling fiscal environment, an open and flexible regulatory framework, simplified industry access points, and global connectivity and export potential, all contribute to the international appeal of the U.K. Undoubtedly, the fiscal environment for emerging life science in the U.K. is globally competitive with R&D tax credits, the Patent Box and, according to the government, the lowest corporation tax rates of any major economy in the world. R&D tax credits are designed to encourage companies to invest in research and development. Earlier in 2015, the government announced changes to improve SME access to R&D tax credits, pledging to introduce voluntary advance assurances lasting 3 years for smaller businesses making a first claim from fall 2015 and reduce the time taken to process a claim from 2016. There will also be new standalone guidance aimed specifically at smaller companies. These new commitments are very welcome and make it easier for SMEs to understand what R&D benefit applies to their businesses and how to navigate that process quickly so that they can get back to the business of innovating the products and therapies of the future. The Patent Box, which allows innovative companies in the U.K. to benefit from a reduced corporation tax rate of 10% on profits from patents and certain other forms of qualifying intellectual property, also continues to bolster the U.K.’s competitiveness as a leading location for biotech businesses. Critical to the success of the U.K. biotech industry has been the strong support of government in creating the funding, capability and fiscal environment to nurture early stage innovation. Innovate UK’s Catapults (organizations set up by Innovate UK, formerly the Technology Strategy Board, to promote R&D collaboration) and the Biomedical Catalyst, funded by Innovate UK and the Medical Research Council (MRC) together are perhaps the best known of these, but the reforms are many and come from across government and funders. Building on the success of the seven established Catapults, the Precision Medicine Catapult was announced in April 2015. Precision medicine is expected to transform the industry in the coming years, and the creation of this new Catapult is focused on making the U.K. the most compelling location in the world for the development and delivery of this new targeted approach. The Biomedical Catalyst, a transformative stimulus scheme for SME life science companies, continues to be vital for the development of the sector with total investment from the initiative – including Innovate UK, MRC and leveraged funding from industry – now reaching nearly $540 million. The government continues to recognize the U.K. bioscience sector as a priority as demonstrated through the appointment of the world’s first Minister for Life Sciences, George Freeman MP, in July 2014 – said to be a sign of Prime Minister David Cameron’s desire to make the U.K. “the best place in the world to develop 21st Century medicines and healthcare technology”. Following the recent General Election, the role of Life Sciences Minister has been re-confirmed and will continue to be filled by George Freeman MP, in a demonstration of continued emphasis on life sciences in the U.K. Continued commitment to the sector is also reflected through the support of several ongoing initiatives. Regenerative medicine and synthetic biology were recognized as two of the government’s ‘Eight Great Technologies’ back in 2013, a selection of technologies that support U.K. science strengths and business capabilities. These up and coming areas of biotech are continuing to receive government funding and support, for example the building of a $85 million large scale Cell Therapy Manufacturing Center and the announcement of three new synthetic biology research centers. The 100,000 Genomes Project, launched in 2012, continues to gather pace with the first patients diagnosed earlier this year. Momentum around the Early Access to Medicines Scheme (EAMS) also continues to build, one year on from its launch. As of April 2015, six Promising Innovative Medicine (PIM) designations have been awarded. The PIM is the first step in the evaluation process and gives indication that a product may be eligible for the scheme based on early clinical data. This is then followed by a pre-submission meeting with the Medicines and Healthcare products Regulatory Agency (MHRA) and submission of an EAMS scientific opinion application with suitable evidence. In March, MSD’s drug Keytruda for the treatment of advanced melanoma, became the first treatment to receive a positive Scientific Opinion from the regulator. In June 2014, Prime Minister David Cameron pledged a drive by the U.K. to discover new drugs and treatments to slow the onset of dementia and aim to deliver a cure by 2025. In July of the same year he also commissioned an independent review into the growing worldwide issue of antimicrobial resistance. Both initiatives demonstrate the U.K.’s ability to lead the charge on global health issues. The vibrancy of the bioscience sector around the globe is strongly represented in the U.K. Building on the current success of the industry, particularly the great fiscal climate in the U.K., the Biomedical Catalyst and the recent crop of stock market launches, the BIA recently published an ambitious vision for the U.K. life sciences sector in 2025. The vision we share is of a vibrant world leading cluster, of the size and scale that Greater Boston is today, as befits our great academic system – Europe’s clear leader as a biotech hub, and widely acknowledged to be in the global top three. The U.K. is already recognized as an attractive location to establish and build biotech companies, with a competitive fiscal environment, supportive government, world class science base and an open and flexible regulatory framework. Over the coming years we will work with the broader community to shape and build our vision, enhancing the U.K. sector and setting the country apart from the rest of Europe and among the big U.S. players as a world leading location for biotech companies. Established over 25 years ago at the infancy of biotechnology, the BioIndustry Association (BIA) is the trade association for innovative enterprises involved in U.K. bioscience. Members include emerging and more established bioscience companies; pharmaceutical companies; academic, research and philanthropic organizations; and service providers to the bioscience sector. The BIA represents the interests of its members to a broad section of stakeholders, from government and regulators to patient groups and the media. Its goal is to secure the U.K.’s position as a global hub and as the best location for innovative research and commercialization, enabling the U.K.’s world-leading research base to deliver healthcare solutions that can truly make a difference to people’s lives. Steve Bates joined the BioIndustry Association (BIA) as its ChiefExecutive Officer in July 2012. Since then the BIA membership has grown 25% and has hosted its most successful gala dinner. On behalf of the sector, Steve has championed the refilling of the Biomedical Catalyst, the improvements to the R&D tax credits system and the establishment of the National Biologics Manufacturing Centre. Steve has led the BIA campaigns for improved access to finance for the sector through initiatives such as Citizens’ Innovation Funds. He attends the Ministerial Industry Strategy Group, EuropaBio’s National Association Council and was a member of the MHRA Expert Group on Innovation in Regulation. Steve is an expert commentator on the sector for traditional and online media including the Financial Times, Wall Street Journal and Bloomberg, BBC radio and television and Sky News, and is a regular presenter at industry-leading conferences. Steve has worked both in biotech and the highest levels of U.K. government for over 15 years. He was Senior Director, External Affairs and Market Access at Genzyme UK and Ireland, during which time he worked on the establishment of the Office for Life Science and was a member of the BIA’s Communications Advisory Committee. Prior to joining the industry Steve was special advisor to John Reid MP in his time as Home Secretary, Secretary of State for Health, Northern Ireland Secretary and Defence Secretary and helped deliver policy initiatives as diverse as “Our inheritance, our future: realizing the potential of genetics in the NHS 2003” to the implementation of the Serious Organised Crime Act of 2005. Earlier in his career Steve led the Labour Party media team into the general election of 2001 and was formerly a broadcast business journalist at Dow Jones and ITN. Steve is a Cambridge University graduate.